An American twist on a French favorite. In France, there's a traditional "violet" mustard made with grape must, the freshly-pressed grape juice (along with skins, seeds, and stems) that's used to make wine. 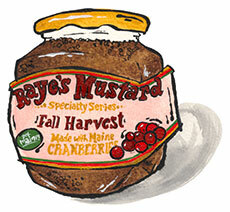 Now, thanks to the mustard mavens at Raye's in Maine, we have our own American version of this mustard made with cranberries. Diced bits of cranberries and cranberry juice are mixed with whole mustard seeds to create a tart, spicy condiment with a pleasant crunch. It would be great on sausages or stirred into potato salad. It's especially awesome with a turkey sandwich.